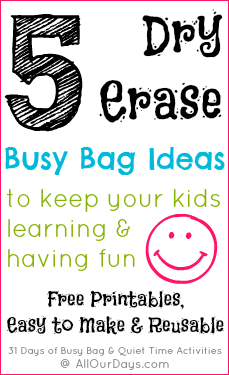 Today we’re sharing links to some of our favorite dry erase busy bag ideas. Our kids love anything involving dry erase markers! I’ve enjoyed finding new dry erase activities to keep the kids learning and having fun. 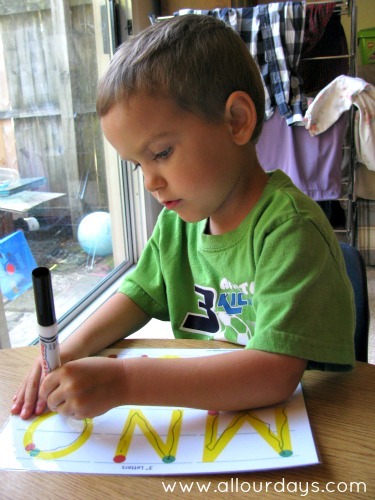 Our kids love I Spy activities, so when we combine I Spy and dry erase markers they are extra happy! To make this free I Spy printable into a busy bag we printed one copy of the I Spy page for each of our kids. We printed them on white cardstock (in black & white), trimmed them to slide into the zip-top bag easier, and laminated them. Updated 5/21/13: Thanks to Cindy we now have these I Spy cards all ready to be printed and cut apart. You can write in your own words if you want them. Then we printed one extra and cut out the objects we wanted them to be able to find. I just picked ones that would be easily recognizable to our kids. We glued these tiny little pictures unto squares of cut index cards (cardstock would work, too). Thanks, Mom! We left room under each picture to write what it is. I still haven’t finished writing on all the cards, but I went ahead and laminated the ones that were finished so the kids could start enjoying their new busy bag…it’s a hit! Our kids can play this I Spy game together or individually by drawing a card and then circling the correct picture on their I Spy mat. We love these Writing Skill Cards from childcareland.com. Scroll almost 3/4 of the way down. The link to the free download is at the very end of the description. We printed the writing skills cards on white cardstock and laminated them for more durability. After you cut them out, you can punched holes in the corners and placed them all on a book ring. We didn’t do this because we often dived the cards between our toddler and preschooler. Our kids use washable dry erase markers to trace the lines (from left to right) and then erase their “writing” with a small cloth rag or a sock that has lost its match. Right now, Jonathan (4 yrs old) is the main one using these cards, but recently Eliya (2 1/2 yrs old) has started showing interest in them as well. Depending on your child’s fine motor skills this could also be a helpful activity into Kindergarten. I recently found this wonderful free printable of large capital letters from ABC Jesus Loves Me. Jonathan struggles with writing, so these larger letters will help give him a boost of confidence. I love that they show where to start and stop with green and red dots! Scroll down until you see the picture then click on the word print. By the way, any tips for teaching left handed children how to write correctly? 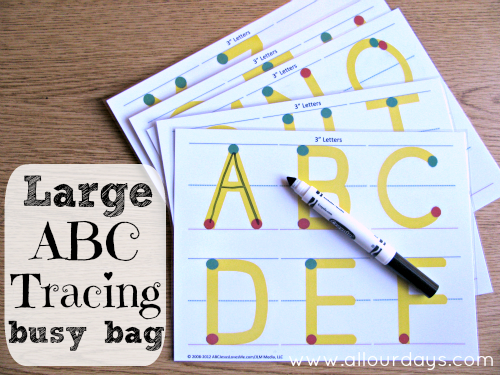 We used these smaller sized alphabet pages from Erica @ Confession of a Homeschooler to make another busy bag. 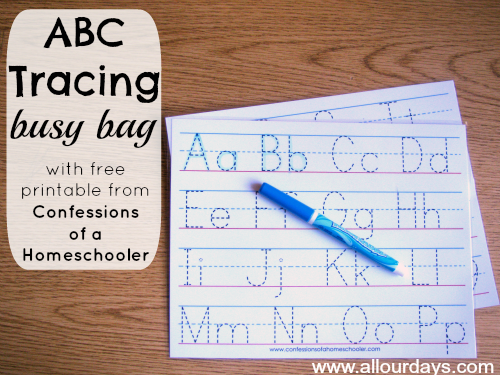 Emahry, our kindergartner uses this busy bag to practice writing capital and lowercase letters as well as numbers 1 through 9. What are some other dry erase activities that could be made into a busy bag? I cannot find the link to the Writing Skills Cards… help, please! Hi! I am trying to find the link for the free download of the large yellow tracing letters but the only thing that seems to be available is purchasing an entire 3 year course? Did this change and it’s no longer available? Thanks! 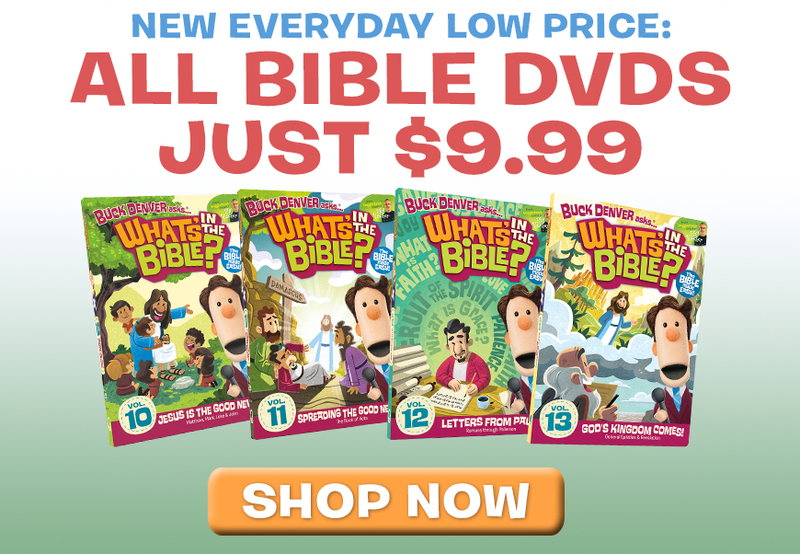 Allyson – Thank you so much for sharing the ABC Jesus Loves Me writing printables. I wanted to let you know that the link has changed with the release of our new website. If you don’t mind, please update the link to http://abcjesuslovesme.com/ideas/learning-to-write. Thank you so much for sharing a link to the ABCJLM 3″ Letter Worksheets. We have completely remodeling our website and I want to let you know that the new link is http://abcjesuslovesme.com/ideas/learning-to-write Thank you! Hi! I love these ideas and I can’t wait to make them. One question tho. Do you laminate them? And if so, do dry erase markers wipe off easily on them? I’ve heard they might not so I’m considering getting wet erase markers. Any advice would be helpful! =) Thank you! 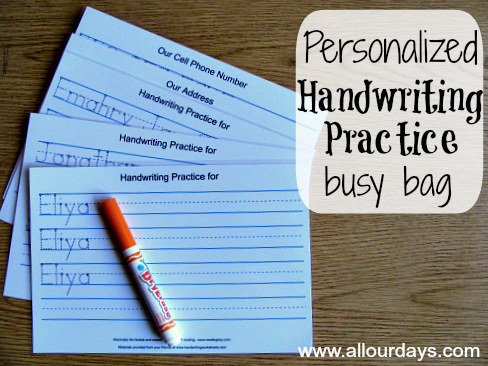 I laminate them and my kids use washable dry erase markers. Sometimes if a mark is left on for a long time it can be difficult to remove but rubbing alcohol usually helps for the stubborn marks. Hello! Wonderful and useful activities. Some of them I can use, but some of them I need in Russian. Which programm do You use to do worksheets? Hi, found you on Pinterest. Trying to find the link to print the Writing Skills cards and I cannot find one. Help, please and thanks! I just contacted the owner of that site to try and find them. I’ll let you know if she gets back to me. If not, maybe I can create something similar. I love SO many of your ideas for teaching preschool; however, many of the links you provided now bring up errors. Do you have a copy of these ideas to share? I just updated the large tracing alphabet link. I’m still working on tracking down a new link for the writing skills cards. No, I don’t sell pre-made busy bags. It’s a great idea, but with my own 5 children ages 6 and under I have my own preschool at home 🙂 Maybe you could have parent volunteers make up some bags for you? For the I Spy game, I typed out the words on two different templates (8.5 x 11 and 8.5 x 12 for those who want to use a trimmed piece of scrapbook paper). If you want the MS word (.doc) version so you can change the words, e-mail me so I can give it to you. I printed mine on scrapbook paper that has a different color on each side so that it would be easy to differentiate the front from the back. When I’m done adding the photos, I’ll scan the pictures and words so that someone can easily print the file, laminate, and cut the squares out. This site is very helpful for getting the right…er left?…tools for lefties. As a lefty in my thirties, I really wish these products had been available when I was little. Hope they help him! I love all your busy bag ideas! I can’t wait to make them!!! My oldest is a lefty and so am I. One thing I noticed right away is all the workbooks designed for learning how to write your letters are incorrect for lefties. I found a great letter formation guide (.pdf) and information at http://www.lefthandedchildren.org/. I also purchased a left-handed writing guide placemat that helps line up the paper and hand so there’s no hooking and less of a mess at https://www.leftyslefthanded.com/Little_Lefty_s_Writing_Guide_p/605410.htm. I hope these help! They’ve helped us. My daughter is in kindergarten and her teacher didn’t even realize she was left-handed until I mentioned it. She said she didn’t notice because her print was so clear. We have done this at the preschool I work at but the dry erase marks do not wipe off completely. Any suggestions? Have the marks been left on the pages for a while or do they still leave marks if you wipe them off right away? You can always use a towel with a tiny bit of rubbing alcohol to get off stubborn marks, but we haven’t had any issue with the washable Crayola dry erase markers. Thank you, for doing that! I thought it was me, lol. For some reason, I can’t get that handwriting practice page thing to work. I have firefox, I made sure I had the latest flash, but still nothing. I can type in my print, but when I try to print the sheet, I one get “student name”, “date” and the advertising blurb/website info at the bottom. I just tried it again myself and the site seems to be having issues. I’d try again later to see if they get it worked out. Sorry I can’t be of more help. Your son looks great doing his letters! I have heard that turning the paper helps them write, but I don’t have any experience with left handed kids. Thanks for sharing at Mom’s Library! I love the I-Spy idea. It would be perfect for our busy bags at church! I love that idea! You can hole punch the top corner of the index card and use the small binder clips (round notebook style clips) to attach them together or even the the front of the I spy page then there is less chance of then losing them. Great idea about the binder rings! Thanks so much for the information! We’ve angled his paper the right way and that seems to be helping. We’re still working on his grip. He can do it, but normally forgets and uses a fist grip. When I remind him he does it correctly. The grip has me a little baffled since he typically displays good fine motor skills…one of his favorite things to do are puzzles! I’ll definitely look into the resources available for lefties…I had never thought of left handed scissors. Love this idea, thanks for sharing and for sharing all these other great sites. I take activity books apart and put mazes, dot-dot-dots, shape tracing and other activities in a special dry-erase notebook. The word searches can be adapted for non-readers by using them as Letter Searches. Seasonal/Holiday pages can be rotated in and out of the notebook easily too. I’ve also laminated pumpkin shapes and let them draw faces on them. Great ideas! We also have dry erase books that are made of various workbook pages. Last Christmas we did a seasonal dry erase busy book for a long car ride and the kids really liked it. I like your idea about drawing faces on pumpkins. I think I need to make a fall themed dry erase book for our kiddos!